Synthetic peptide within Human NeuN aa 1-100 (Cysteine residue). The exact sequence is proprietary. This antibody gave a positive signal in the following tissue lysates: Mouse Brain; Mouse Cerebellum; Rat cerebellum; Human Fetal brain as well as the following whole cell lysates: 293T, HeLa and SH-SY5Y lysates; SH-SY-5Y cells. Flow Cyt: U-87MG cells. Our Abpromise guarantee covers the use of ab209898 in the following tested applications. WB Use at an assay dependent concentration. Detects a band of approximately 48.50 kDa (predicted molecular weight: 34 kDa). 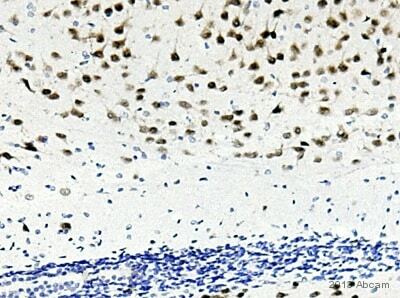 IHC image of NeuN (ab177487) with Anti-Rabbit IgG VHH Single Domain Antibody (HRP) (ab191866) staining in formalin fixed paraffin embedded normal human cerebellum tissue section. The section was dewaxed and then pre-treated using heat mediated antigen retrieval with sodium citrate buffer (pH6) in a Dako Pascal pressure cooker using the standard factory-set regime. Non-specific protein-protein interactions were then blocked using in TBS containing 0.025% (v/v) Triton X-100, 0.3M (w/v) glycine and 3% (w/v) BSA for 1 hour at room temperature. The section was then incubated with rabbit monoclonal antibody [EPR12763] to NeuN (ab177487, 0.1µg/ml) in TBS containing 0.025% (v/v) Triton X-100 and 3% (w/v) BSA overnight at +4°C. Endogenous peroxidases were quenched using 1.6% (v/v) hydrogen peroxide in TBS containing 0.025% (v/v) Triton X-100 for 30 minutes at room temperature, with agitation. The secondary antibody, Anti-Rabbit IgG VHH Single Domain Antibody (HRP) (ab191866, 1.0µg/ml) was then applied for 1 hour at room temperature in TBS containing 0.025% (v/v) Triton X-100 and 3% (w/v) BSA before being developed for 10 minutes at room temperature using Steady DAB/Plus (ab103723). The section was then counterstained with hematoxylin and mounted with DPX. The negative control (secondary antibody only, no primary) inset shows no staining, demonstrating secondary antibody specificity. This data was developed using the same antibody clone in a different buffer formulation containing PBS, BSA, glycerol, and sodium azide (ab177487). Immunocytochemistry/ Immunofluorescence - Anti-NeuN antibody [EPR12763] - BSA and Azide free (ab209898)Zhao et al PLoS One. 2016 Apr 5;11(4):e0152551. doi: 10.1371/journal.pone.0152551. eCollection 2016. Fig 2. Immunocytochemsitry analysis of neurons labeling nuclei with NeuN. Primary cortical neurons were prepared from the cortices of 1-day-old newborn pups. Briefly, the cortices were dissected in cold PBS. Tissues were collected and washed in PBS, and 0.05% (v/v) trypsin was added for digestion at 37°C for 15 minutes. The digestion was stopped by the addition of fetal bovine serum to a final concentration of 10% (v/v). Cells were collected by centrifugation at 800 x g for 10 minutes to remove the PBS and were resuspended in Neurobasal medium supplemented with 2% (v/v) B27. Neurons plated out were rinsed with PBS three times and then fixed in 4% paraformaldehyde for 25 minutes at 4°C. Fixed cells were incubated in 0.1% (v/v) sodium citrate contain 0.1% (v/v) Triton X-100 for 2 minutes on ice, and then neurons were washed twice with PBS and incubated with 300 μl ab177487 (1:500 in PBS containing 10% goat serum) for 2 hours at 37°C. An Alexa-Fluor® 594-conjugated goat anti-rabbit IgG (1/1000) was used as the secondary antibody. DAPI (4',6-diamidino-2-phenylindole) was added for 10 minutes at room temperature followed by PBS washing to fluorescently label nuclei. Samples were photographed using a fluorescence microscope (LEICA DMI3000, Japan) and analysed using the Leica application suite. Neuronal nuclei were labeled with ab177487 (top left panel, red), while all cells nuclei were stained in blue (top right panel). (Purity of cultured mouse cortical neuron was 93.00% ± 1.23% at 7 days in vitro). Overlay histogram showing U-87 MG (Human glioblastoma-astrocytoma epithelial cell line) cells stained with ab177487 (red line). The cells were fixed with 80% methanol (5 minutes) and then permeabilized with 0.1% PBS-Tween for 20 minutes. The cells were then incubated in 1x PBS / 10% normal goat serum / 0.3M glycine to block non-specific protein-protein interactions followed by the antibody (ab177487, 1/100 dilution) for 30 minutes at 22ºC. The secondary antibody used was Alexa Fluor® 488 goat anti-rabbit IgG (H&L) (ab150081) at 1/2000 dilution for 30 minutes at 22ºC. Isotype control antibody (black line) was rabbit IgG (monoclonal) (ab172730, 1μg/1x106 cells used under the same conditions. Unlabeled sample (blue line) was also used as a control. Immunocytochemsitry/Immunofluorescence analysis of SH-SY5Y (Human neuroblastoma cell line from bone marrow) cells labeling NeuN (green) with purified ab177487 at 1/300. Cells were fixed with 4% paraformaldehyde. An Alexa Fluor® 488-conjugated goat anti-rabbit IgG (1/200) was used as the secondary antibody. Counterstained with DAPI (blue). Immunocytochemsitry/Immunofluorescence analysis of SH-SY5Y (Human neuroblastoma cell line from bone marrow) cells labelling NeuN (green) with unpurified ab177487 at 1/80. Cells were fixed with 4% paraformaldehyde. An Alexa Fluor® 488-conjugated goat anti-rabbit IgG (1/200) was used as the secondary antibody. Counterstained with DAPI (blue). Immunohistochemistry (Formalin/PFA-fixed paraffin-embedded sections) analysis of human gliocytoma tissue labelling NeuN with purified ab177487 at 1/3000. Heat mediated antigen retrieval was performed using Tris/EDTA buffer pH 9. A prediluted HRP-polymer conjugated anti-rabbit IgG was used as the secondary antibody. Counterstained with Hematoxylin. Immunohistochemistry (Formalin/PFA-fixed paraffin-embedded sections) analysis of human gliocytoma tissue labelling NeuN with unpurified ab177487 at 1/800. Heat mediated antigen retrieval was performed using Tris/EDTA buffer pH 9. A prediluted HRP-polymer conjugated anti-rabbit IgG was used as the secondary antibody. Counterstained with Hematoxylin. ?An independent comparison of commercially available NeuN clones in IHC-Fr (acetone-fixed mouse dentate gyrus sections). Competitor A: Leading mouse monoclonal. Competitor B: Non-Abcam rabbit monoclonal. ab177487 produces intense, specific staining with minimal background, even at half the dilution of competing antibodies. IHC-Fr staining of NeuN on zebrafish brain tissue at 4 days post-fertilization using ab177487 (1/100). The sections were fixed in paraformaldehyde and permeabilized using triton X. Antigen retrieval uisng sodium citrate was used. The sections were blocked using 5% BSA for 1 hour at 23°C. ab177487 was diluted 1/100 and incubated for 16 hours at 4°C. The secondary antibody used was anti rabbit IgG conjugated to Alexa Fluor® 488 (1/1000). DAPI used as counterstain. Immunohistochemistry (PFA perfusion fixed frozen sections) - Anti-NeuN antibody [EPR12763] - BSA and Azide free (ab209898)This image is courtesy of an abreview submitted by Carl Hobbs&#44; Kings's College London&#44; United Kingdom. IHC-FoFr staining of NeuN staining on mouse pons sections using ab177487 (1/6000). The mouse was perfusion fixed using formaldehyde and 20µm sections were permeabilized with 0.5% tween. Blocking was performed using 1% BSA. ab177487 was diluted 1/6000 and incubated with the sections for 16 hours at 21°C. Secondary antibody used was goat polyclonal to rabbit IgG conjugated to Alexa Fluor® 594 (1/1000). ?An independent comparison of commercially available NeuN clones in IHC-P. Sodium citrate was used for antigen retrieval in all 3 samples. ab177487 produces specific staining, equivalent to the leading mouse monoclonal at half the dilution. The non-Abcam mouse monoclonal was less specific as it stained Purkinje cells, which do not express NeuN. ab177487 staining NeuN in mouse embryonic day 15 brain tissue sections by Immunohistochemistry (PFA perfusion fixed frozen sections). Tissue samples were fixed by perfusion with paraformaldehyde, permeablized with 0.5% Triton X-100 in PBS, blocked with 10% serum for 1 hour at 25°C and antigen retrieval was by heat mediation in citrate buffer, pH 6. The sample was incubated with primary antibody (1/500 in PBS + 1% serum + 0.1% Triton X-100) for 16 hours at 25°C. An Alexa Fluor®594-conjugated Donkey anti-rabbit IgG (H+L) polyclonal (1/700) was used as the secondary antibody. 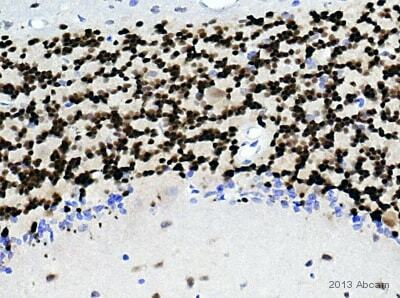 ab177487 staining NeuN in mouse brain tissue sections by Immunohistochemistry (IHC-Fr - frozen sections). Tissue was fixed with formaldehyde and blocked with Triton X-100 + 0.4% horse seurm for 30 minutes at 20°C. Samples were incubated with primary antibody (1/500 in blocking solution) for 16 hours at 4°C. An Alexa Fluor® 594-conjugated donkey anti-rabbit IgG polyclonal (1/200) was used as the secondary antibody. 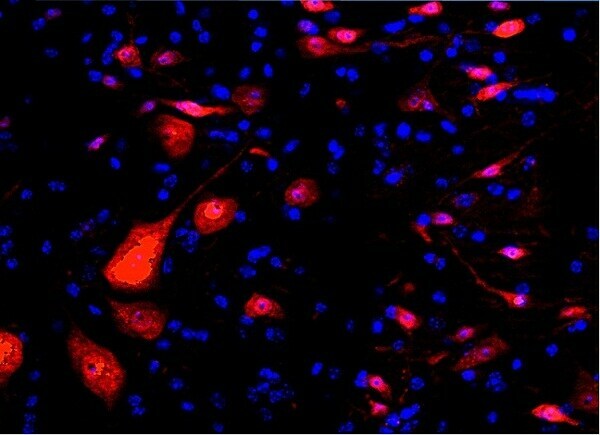 Immunohistochemistry (Formalin/PFA-fixed paraffin-embedded sections) - Anti-NeuN antibody [EPR12763] - BSA and Azide free (ab209898)This image is courtesy of an abreview submitted by Carl Hobbs&#44; Kings's College London&#44; United Kingdom. IHC-P image of NeuN (green) and GFAP (red) double staining on mouse cerebellum sections using ab177487 (1/5000) and ab4674 (1/1500) respectively. ab177487 staining NeuN in mouse free floating 50 micron lumbar spinal cord tissue sections by Immunohistochemistry (IHC-Fr - frozen sections). Tissue was fixed with formaldehyde, permeabilized with Triton X-100 and blocked with 10% serum for 2 hours at 25°C. Samples were incubated with primary antibody (1/500 in PBS + Triton) for 16 hours at 4°C. An Alexa Fluor® 594-conjugated donkey anti-rabbit IgG polyclonal (1/700) was used as the secondary antibody. IHC-P image of FOX3/NeuN staining on cat cerebellum sections using ab177487 (1/1000). Sections were de-paraffinized and subjected to heat mediated antigen retrieval using citric acid. The sections were blocked using 1% BSA for 10 minutes at 21°C. ab177487 was diluted 1/1000 and incubated with the sections for 2 hours at 21°C. The secondary antibody used was goat polyclonal to rabbit IgG conjugated to biotin (1/250). IHC-P image of FOX3/NeuN staining on dog cerebellum sections using ab177487 (1/500). Sections were de-paraffinized and subjected to heat mediated antigen retrieval using citric acid. The sections were blocked using 1% BSA for 10 minutes at 21°C. ab177487 was diluted 1/500 and incubated with the sections for 2 hours at 21°C. The secondary antibody used was goat polyclonal to rabbit IgG conjugated to biotin (1/250). IHC-P image of FOX3/NeuN staining on sheep brain (Frontal cortex) sections using ab177487 (1/1000). Sections were de-paraffinized and subjected to heat mediated antigen retrieval using citric acid. The sections were blocked using 1% BSA for 10 minutes at 21°C. ab177487 was diluted 1/1000 and incubated with the sections for 2 hours at 21°C. The secondary antibody used was goat polyclonal to rabbit IgG conjugated to biotin (1/250). IHC-P image of FOX3/NeuN staining on goat cerebellum sections using ab177487 (1/500). Sections were de-paraffinized and subjected to heat mediated antigen retrieval using citric acid. The sections were blocked using 1% BSA for 10 minutes at 21°C. ab177487 was diluted 1/500 and incubated with the sections for 2 hours at 21°C. The secondary antibody used was goat polyclonal to rabbit IgG conjugated to biotin (1/250). IHC-P image of FOX3/NeuN staining on marmoset cerebellum sections using ab177487 (1/2000). Sections were de-paraffinized and subjected to heat mediated antigen retrieval using citric acid. The sections were blocked using 1% BSA for 10 minutes at 21°C. ab177487 was diluted 1/2000 and incubated with the sections for 2 hours at 21°C. The secondary antibody used was goat polyclonal to rabbit IgG conjugated to biotin (1/250). IHC-P image of FOX3/NeuN staining on zebrafish spinal cord sections using ab177487 (1/500). Sections were de-paraffinized and subjected to heat mediated antigen retrieval using citric acid. The sections were blocked using 1% BSA for 10 minutes at 21°C. ab177487 was diluted 1/500 and incubated with the sections for 2 hours at 21°C. The secondary antibody used was goat polyclonal to rabbit IgG conjugated to biotin (1/250). 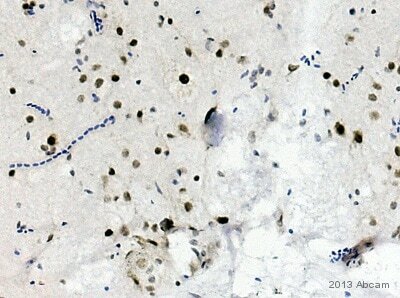 IHC-P image of FOX3/NeuN staining on rat brain (SVZ) sections using ab177487 (1/2000). Sections were de-paraffinized and subjected to heat mediated antigen retrieval using citric acid. The sections were blocked using 1% BSA for 10 minutes at 21°C. ab177487 was diluted 1/2000 and incubated with the sections for 2 hours at 21°C. The secondary antibody used was goat polyclonal to rabbit IgG conjugated to biotin (1/250). 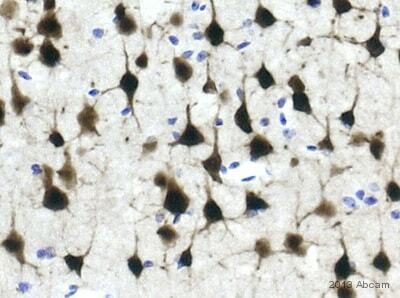 IHC-P image of FOX3/NeuN staining on mouse brain (frontal cortex) sections using ab177487 (1/800). Sections were de-paraffinized and subjected to heat mediated antigen retrieval using citric acid. The sections were blocked using 1% BSA for 10 minutes at 21°C. ab177487 was diluted 1/800 and incubated with the sections for 2 hours at 21°C. The secondary antibody used was goat polyclonal to rabbit IgG conjugated to biotin (1/250). Publishing research using ab209898? Please let us know so that we can cite the reference in this datasheet. There are currently no Customer reviews or Questions for ab209898.